Jim Law of Linden Vineyards, Virginia finds harvest a little slow. Every vintage has its personality. During the growing season, our job as winegrowers is to guide and nurture our vines through the good times and not so good times. Much like raising children, some vintages are easy, but most are not. Wet vintages require more intervention and guidance as the vines, through no fault of their own, take on a bit of a wild streak. Ample water availability during the growing season makes vines unruly, like kids fed too much sugary junk food. This was the case for the growing season of 2013. Until September. September defines the quality and style of the wine. The bad behavior of the previous six months can be easily forgiven and forgotten if September is bright and sunny. September 2013 rewarded us for all our diligence during the growing season. The wild child of summer finally found a niche and thrived into early adulthood. With the exception of one very brief rain shower, we had no rain in September. This is quite remarkable in the mid Atlantic. 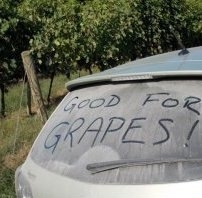 During our fall (your autumn) dusty gravel roads and brown grass gladden the winemaker's heart. Days were warm and sunny, nights were very cool. Ripening has been slow, preserving very fresh acidity and aromatics in the whites. Clonal differences in Chardonnay have been remarkable. Vineyard blocks planted to Dijon clones were picked a few weeks ago, but the California clone #4 is still waiting to be picked. Clone #4 thrives in early ripening vintages, but drags its feet when temperatures fall. Red grapes have crunchy, red berry flavors and thick skins with lots of fine tannin. Seed development is lagging. 'Green' seeds can give red wines bitterness, so we will need to be very cautious during the fermentations so as not to extract too much from the seeds. Cooler, shorter fermentations may be in order. Sugar levels are low, which means wines will be in the high 12% to low 13% alcohols. At the time of writing we have harvested Merlot, which may be the star red grape as it has a preference for cooler ripening conditions. The wines should be very fresh and feminine. However, Merlot will need structure and length from its blending partners, Cabernet Franc and Cabernet Sauvignon. The month of October will answer the most important question of 2013: will Cabernet Sauvignon ripen this year? This has been a leisurely harvest. Quantities have been down due to a various bouts of frost, hail, insects and now critters, especially raccoons and bear. Cool weather slows ripening. It has been a bit of a waiting game. In most vintages we wait for sunny weather to dry out the grapes after diluting rains. This waiting game is much better. Personally, I have found that the slow pace has been mentally difficult. Once the rush of harvest starts there is a certain rhythm that keeps us energized. Too much down time slows the metabolism. Pauses in harvest have been good for old bones to recuperate. The difference between a hard physical work day now versus 20 years ago is found in the day after. The recovery time is never enough. My job has shifted from being in the middle of it all to staying one step ahead. We have a very capable, experienced team in place that gives me this luxury. I am finding that having more contemplative time has given the wines more precision. Stepping back isn't so bad after all.